Program-level analyses describing program characteristics, geographic location, apprenticeship characteristics and training information on source/mode of related instruction are presented in Tables 6-10 and include descriptive results on 121 apprenticeship programs in the RAPIDS database. The sample size for these program-level analyses can be very small (single digits), so the results should be interpreted with caution. Table 6 presents data on program-level statistics by the four large occupational groups. Of the 121 programs in the database, 56 programs (46%) enroll CNAs with an average total workforce (defined as apprentices plus all other employees) of 1,803 persons across an average of 16 sites, 18 programs (15%) enroll DSSs with a mean total workforce of 259 apprentices across a mean of 16 sites, 34 programs (28%) enroll HSSs with an average total workforce of 147 apprentices, and 13 programs (11%) enroll HHAs with a mean total workforce of 311 apprentices. The assisted living facilities employing HSSs and the home health agencies employing HHAs each have only an average of one site. Only CNA and DSS programs involve multiple sites (18% and 11% respectively). 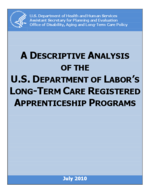 None of the assisted living facilities or home health agencies operate their apprenticeship programs across more than one site. There are six nationally-sponsored apprenticeship programs, representing 5% of all programs in the RAPIDS database. Only CNA programs have any national sponsored programs (11% of these programs). 79 of the 121 programs sponsoring apprenticeships during the last 5 years currently have registered apprentices. Almost half (56) of the 121 programs are for CNAs, followed by 34 for HSSs working in assisted living facilities, with the remaining programs split between DSS programs (18) and HHA programs (13). The most common program is administered by a relatively small nursing home or assisted living facility, but several large hospital systems, nursing homes, and a group home operator have large programs with substantial numbers of apprentices. Almost all programs operate in single sites, with a few nursing home and assisted living chains operating in multiple sites. Half the programs (61) are located in the Midwest, with most of the remaining in the Southeast (12), Central (16), and West (16) regions. Only a few programs are in the Northeast (5) and Mid-Atlantic (5) regions. Only 6 programs are national programs. Trainings on average last about one year, but length greatly varies across the four major occupations. Trainings on average have about 320 hours of related instruction. Community colleges are the most frequent source of related instruction (38%), with onsite instruction (27%) and vocational schools (23%) the next most frequent sources of such instruction. All but one of the DSS and HSS programs are competency-based (as opposed to time-based), as are 8 of the 13 HHA programs but only half of the 56 CNA programs. Only 21 of the 121 programs offer advanced or specialty training. The geographic distribution of all programs is as follows: five programs each are located in Northeast and Mid-Atlantic (4% each), 12 programs are located in Southeast (10%), 16 programs in the Central region (14%), 61 program in the Midwest (53%) and six programs in the West (14%). CNA programs are distributed in every geographic region. Not all programs are represented in each geographic region. For example, there are no DSS programs in the Mid-Atlantic region, no HSS programs in the Northeast and Mid-Atlantic regions and no HHA programs in the Northeast and West regions. The largest concentration of programs by region for each occupation is in the Midwest region (48% for CNA programs, 38% for DSS programs, 68% for HSS programs and 77% for HHA programs). The overall mean length of apprenticeship program is 2,621 hours across all programs. CNA programs have 1,720 hours on average, compared to 3,296 hours for DSS programs, 4,256 hours for HSS programs, and 1,289 hours for HHA programs. The average length of related instruction of 319 hours is distributed as follows: 330 hours for CNA programs, 349 hours for DSS programs, 361 hours for HSS programs and 122 hours for HHA programs. Related instruction in each of these occupations is longer than the federally required 75 hours of instruction. The program-level RAPIDS data provide the opportunity to examine where and how the related instruction takes place. However, RAPIDS mixes the source (where) and the mode (how) within the same categorical variable, so it is not possible to completely disentangle the issues of location of training and method of training delivery because only a few programs respond to both issues. Rather than losing one of these characteristics (source and mode) by omitting them from the analysis, we report on both characteristics together as found in the single RAPIDS variable. Over 26% of all related instruction takes place onsite where each sponsor is located. Community colleges provide instruction for 38% of all programs, and vocational schools provide instruction for 23% of all programs. Ten percent of programs are offered on line (web-based), 9% are offered by correspondence course, and slightly less than 2% are located at technical schools. SOURCE: RTI International/Urban Institute analysis of RAPIDS data. * Source/Mode of Related Instruction -- categories are not mutually exclusive: one program can have instruction from several sources. The source/mode of related instruction varies by program type. Among CNA programs, the most frequent source/mode was a vocational school (45%), followed by onsite sponsor location (27%), and community college (29%). For DSS programs, the most frequent source/mode was a community college (44%), followed by correspondence course and onsite sponsor location (33% each) and web-based programs (22%). For HSS programs, the most frequent source/mode was a community college (73%), followed by correspondence course (15%) and web-based (12%). Among apprenticeship programs for HHAs, most related instruction was conducted onsite (77%), followed by community college (15%) and vocational school (8%). We also conducted the same sensitivity analyses for these program-level statistics by removing the four large employers noted in the prior section on apprentice-level findings. The change in results though was much less substantial. Only total workforce size for DSSs, HSSs, and HHA employers became smaller after removing the four programs. No other program-level characteristics changed greatly. Table 7 presents the same characteristics as in Table 6, but only for CNA programs, comparing time-based (28 programs), competency-based (13 programs), and specialty programs (15 programs). Most of the time-based programs are concentrated in the Midwest, Southwest and Central regions. No CNA programs are nationally sponsored in the time-based program. In addition to national programs which represent 16%, entry-level competency-based CNA programs are only available in three regions -- the Midwest, Southwest and Central regions. Advanced and specialty programs for CNAs are available in the Southeast, West, Northeast and Mid-Atlantic regions. Twenty-seven percent of advanced and specialty CNA training programs are national. Regarding term length, time-based CNA programs are on average the longest (2,240 hours), compared to 1,312 hours for advanced/specialty programs and 1,071 hours for entry-level competency-based programs. Related instruction length and source/mode also varies by type of training: time-based programs average 525 hours of related instruction and are mostly conducted at vocational schools (61%) and onsite (18%), compared to a mean of 155 hours for entry-level competency-based programs and an average of 121 hours for advanced/specialty programs. About 7% of related instruction for time-based programs is web-based. Entry-level competency-based programs are equally likely to be conducted at vocational schools and onsite (38% each) followed by community colleges. None of the entry-level competency-based programs are conducted via the web or by correspondence, or at technical schools. Related instruction for the advanced/specialty programs is most frequently conducted at community colleges, followed by onsite training and vocational schools. About 13% of related instruction for advanced/specialty programs is web-based. Additional detailed information for each specialty competency for CNAs is shown in Table A-3 in Appendix A. Table 8 presents the program characteristics for DSS programs comparing the one entry-level time-based program versus the 17 entry-level competency-based programs. In terms of geographic location, the only time-based program is located in the Midwest. There are no national programs. Entry-level competency-based programs are distributed across the country and are located in every region with the exception of the Southwest with the highest concentration in the West and Central regions. The one time-based program has a term length of 2,127 hours with 266 hours of related instruction which is conducted onsite by its sponsor. On average, the entry-level competency-based DSS programs are 3,365 hours long and have a mean of 356 hours of related instruction. Related instruction for these programs is most commonly conducted at a community college (47%), followed by training by correspondence (35%), onsite training by the sponsor (29%) and web-based training (23%). Table 9 presents the program-level data for HSS programs. The mean workforce size across the 34 programs was 147 workers. Geographically, 23 of the programs (68%) are in the Midwest, with the remainder spread fairly evenly across the Central and West regions, and only one in the Southeast. The mean term length was 4,256 hours, and the average length of related instruction was 360 hours. Regarding the source/mode of related instruction, community colleges provided 74% of training, 15% was provided through correspondence courses, and 12% was via web-based courses. Table 10 compares characteristics on the 13 HHA programs across the five time-based programs (38% of the total), the two entry-level competency-based programs (15% of the total) and the six specialty programs (46% of these programs). The mean employer workforce size is largest for the entry-level competency-based programs (840) as compared to the much smaller workforces in the time-based (307) and specialty (137) programs. None of the programs has multiple sites (each program is a standalone program). Geographically, most of the time-based programs are located in the Midwest (80%), with the others located in the Mid-Atlantic region. The entry-level competency-based programs are in the Southeast and the Midwest. One specialty program is located in the Central region and five are in the Midwest. Term length in time-based programs averages 1,211 hours with a mean of 168 hours of related instruction which is conducted onsite by employers. The two entry-level competency-based programs average 2,000 hours of instruction and average 128 hours of related instruction with one conducted onsite by the sponsor and one conducted at a community college. Term length in specialty programs averages 1,117 hours with a mean of 82 hours of related instruction, which is mostly conducted onsite (67%), followed by community colleges and vocational schools (17% each). Additional detailed information for each specialty training for HHAs is shown in Table A-4 in Appendix A. Appendix A Table A-5 and Table A-6 provide a list of the programs contained in the data and the number of apprentices they contribute by major occupation. Table A-5 lists all programs (121) regardless of whether they had currently enrolled (registered) apprentices at the date of the RAPIDS data extract (December 2009). Table A-6 lists only those programs (79) with currently enrolled (registered) apprentices as of December 2009. We discuss results across these two tables to provide sufficient context for understanding. The most common program is located within a relatively small (100 total employees) nursing home or assisted living center, which may or may not be part of a chain. Several entities operate small group homes for persons with intellectual disabilities with approximately 25 employees in each home. A detailed review of the data provides an understanding of several large programs that skew the results on total workforce size and apprentices upward. Several large hospital systems and large providers of group homes employ substantial numbers of apprentices. For example, St. Johns Mercy Medical Center in St. Louis, Missouri, has employed 644 apprentices over time and now trains 324. Developmental Services, Inc. in Indiana, which services group homes for persons with intellectual disabilities has provided 924 apprenticeships over time and 274 currently. Nearly 400 apprentices have been sponsored by the Gary Job Corps in Texas, but none were currently enrolled as of December 2009. In addition, several large nursing home programs contribute large numbers of apprentices. The Evangelical Lutheran Good Samaritan Society is a chain of nursing homes with 122 branches (nursing homes), each having approximately 100 employees, contributed 254 apprentices overall but only 84 currently. The Georgia Health Care Association program is an association with 55 participating nursing homes averaging 100 employees each, contributed 120 apprentices overall and 69 current apprentices. The three largest contributors of currently enrolled CNAs are St. Johns Mercy Medical Center in St. Louis (174), the Evangelical Lutheran Good Samaritan Society in South Dakota (84), and the Georgia Health Care Association located in suburban Atlanta (69). The three largest contributors of currently enrolled DSSs are Developmental Services, Inc. in Indiana (274), Macomb Oakland Regional Center in Michigan (22), and Hope Community Resources in Alaska (19). The three largest contributors of currently enrolled HSSs are St. Johns Mercy Medical Center in St. Louis (82), Comfort Keepers in San Diego (43), and Memorial Health System in Kansas (39). The three largest contributors of currently enrolled HHAs are St. Johns Mercy Medical Center in St. Louis (68), Harbor Home Healthcare in Michigan (9), and Home Care Associates of Philadelphia (8).